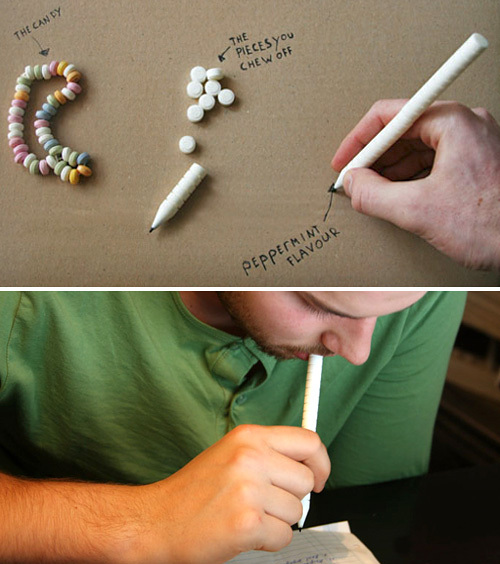 Edible Candy Pens Make It Ok To Chew On Them | OhGizmo! Personally I don’t see the problem with chewing on one’s pen. It can provide a useful distraction when enduring long meetings, and it pretty much guarantees no one will ever ask to borrow it if you’ve done a good enough job gnawing it down. 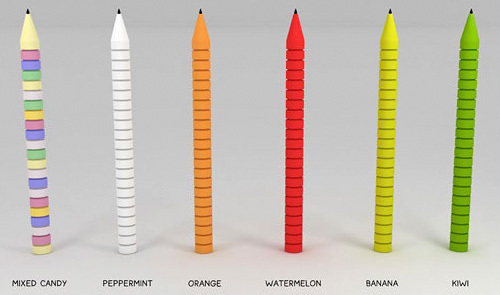 There is one downside though, they tend to taste awful, which is a problem design student Dave Hakkens has solved with his Edible Pen. He originally set out to create a chewable pen that wouldn’t get dirty, but he realized that 90% of a pen is discarded once the ink’s run out, so instead he set upon the task of making one that was almost completely edible. The fruits (and peppermints) of his labor is the design pictured above which is broken up into bite-sized segments that have roughly the same texture and consistency as a candy necklace. It also won’t melt in your hands which is kind of important, and since it even uses edible inks, in the end the only thing you’ll have left to discard is the pen tip. Sadly the Edible Pens only exist as prototypes at this point, but I hope Bic is listening as a blue raspberry version of their classic ballpoint pen sounds pretty tasty to me. This concept seems like a sticky mess waiting to happen. Trouble is… the pen would be eaten before I got any work done! That seems like a great idea, however you may want to consider the fact that the pen could end up in the bottom of a teenager’s backpack or in their pocket… Maybe some sort of carrying case for them would make it much more sanitary.